Amid considerable hype of its own making, NASA is announcing the discovery an eighth planet around the distant solar system, Kepler 90. For about a week, the media has been wondering what today’s announcement might bring. TRAPPIST-1? New planets? Instead, the space agency presented something a bit more mundane, but interesting nonetheless: Google assisted NASA in applying machine learning to astronomical observations, scraping through previously acquired data to spot an eighth planet around Kepler 90. 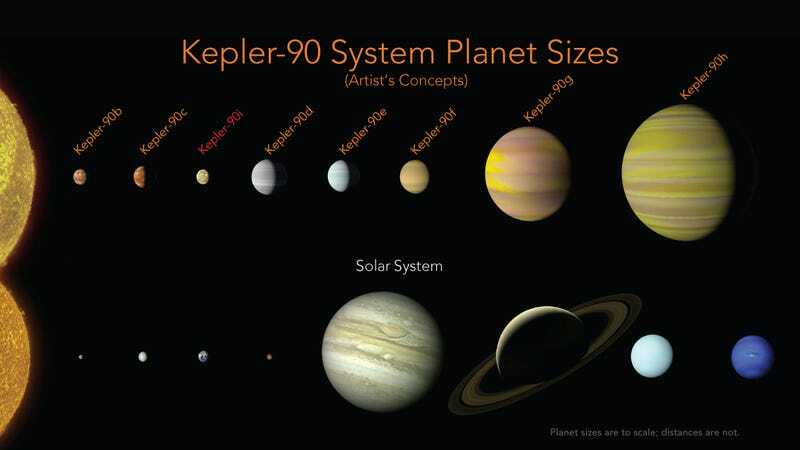 “It ties Kepler 90 with our own Solar System for having the most known planets,” said Paul Hertz, Astrophysics Division director at NASA Headquarters, during NASA’s press conference. Christopher Shallue, senior software engineer at Google AI explained that they trained a machine to identify the “weak signals” of planets as orbiting planets dimmed the brightness of stars from our vantage point. When they looked through existing Kepler data, they found two new planets: Kepler-90i and Kepler-80g, matching the number of planets within Kepler 90 to our own Solar System (sorry, Pluto is still not a planet). “Now we’ve shown that neural networks can also identify planets in data collected by the Kepler Space telescope,” said Shallue. These planets had weak signals missed by previous searches of the stars. He followed that it’s similar to the way that a computer might learn to identify cats and dogs. Kepler 90, 2545 light-years from Earth, is obviously quite different from our own solar system. Its planets are much closer to its star, explained Andrew Vanderberg, astronomer and NASA Sagan Postdoctoral Fellow at The University of Texas, Austin. This discovery demonstrates the diversity of planetary systems, said Jessie Dotson, Kepler project scientist at NASA’s Ames Research Center in California’s Silicon Valley. Kepler is an exoplanet-hunting satellite and observatory that trails the Earth and orbits the Sun. It discovered 2,341 confirmed exoplanets in its first mission that began in 2009. Two of its four reaction wheels, used to help it stay pointed at a star, failed in 2013. Since then, NASA renamed the mission K2, and it had discovered another 184 confirmed exoplanets before today’s announcement. NASA had kept the details of the most recent announcement under wraps aside from a media advisory stating that Google’s Artificial Intelligence was involved in some new discovery. These sorts of hype cycles draw some speculation, create unnecessary hype, and prevent science journalists from properly digesting the research or vetting it with outside experts. But we did manage to talk to one.